AMoA is located 933 2nd Street in downtown Alexandria. Phone 318.443.3458 for information and current hour of operation. An admission fee is charged. The Coughlin-Saunders Performing Arts Center is located at 1202 Third Street, in downtown Alexandria. The museum in downtown Alexandria is housed in the restored home that was the birthplace of the poet Arna Bontemps, renowned as one of the leaders of the Harlem Renaissance. The museum and cultural center is located at 1327 3rd Street, and is one of the featured sites on the Louisiana African American Heritage Trail. The first Catholic church, St. Francis, was built in 1817 in Alexandria, actually the first church of any denomination in the city. In 1895, Reverend Leonard Menard envisioned a larger place of worship. The cornerstone of the present cathedral building was laid on December 3, 1895, the feast day of St. Francis Xavier. A few weeks later, on December 30, 1895, the original church on Front Street burned. Today, St. Francis Xavier Cathedral still boasts some of the most beautiful stained-glass windows in the state of Louisiana. The rose windows in the apex of the transept are the largest in the state, and the main altar is hand-carved walnut. The St. Francis Xavier Catholic Cathedral complex includes the cathedral building itself, located at 626 Fourth Street, St. Francis Academy (erected in 1897), and the rectory. River Oaks is a visual arts and crafts center located in the Bolton House (circa 1899) and a newer studio annex building. It is home to more than 30 resident artists with a combination of activities including workshops, lectures, exhibitions, and special events. Visitors also have the opportunity to visit with the artists as they work. 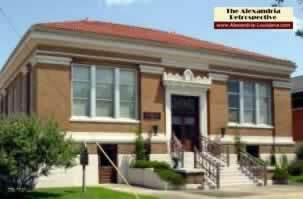 The Arts Center is located at 1330 Second Street in downtown Alexandria. Admission is free. Phone 318.473.2670 for additional information.